In some countries, people trade arms. In others, drugs are smuggled across borders. But in several African countries right now, a computer board no bigger than a bank card is being filtered in via discreet means. The Raspberry Pi launched just over a year ago and it's already making waves around the world. Big waves. 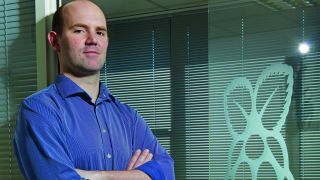 "These pop up in all sorts of environments," Raspberry Pi founder and executive director Eben Upton tells us. "Although we haven't focused on it, it's happening in Africa." "These are kind of suitcase Pis. They're Pis that haven't necessarily gone through formal distribution," he says. "What happens is that people put them in suitcases and carry them in." While Raspberry Pi's distributors cover 85 per cent of the world's GDP, some African countries, though very populous, don't contribute enough for them to be seen as economically viable enough. "We didn't think about the developing world early on. And then what we found is that it's kind of just been cropping up there anyway." The success of the Pi in the developing world has caught Upton and the rest of the team by surprise, but as he admits, it also makes perfect sense: "You've just entered the middle class and the first thing you buy is a television, a lot of people buy a television before they buy a fridge. "And then you've got this television, maybe a second hand television that's been exported from the West. And then you can invest a little bit more and make it a computer." It's a fascinating chapter in the Raspberry Pi story that a lot of people will have skipped over. After all, this tiny computer has its humble roots all the way back in Cambridge, where Eben Upton began the Raspberry Pi Foundation in 2009. Despite being told by the East of England Development Agency that Pi was an "unsellable product", Upton's team was determined to prove that this was the key to restoring life back into computer science in the UK. "We were told no one would buy this," he says. And in February 2012 that vision became a reality as the Raspberry Pi launched official. A year later it soared past expectations and sold one million units, the bulk of which are manufactured in Wales. But the chip itself, a Broadcom BCM2835 SoC based on ARM architecture, isn't a product - it's an answer to a fundamental problem with Britain's education system, itself a key link in the chain of the UK's technology industry. Over the years, computer science in Britain has been deformed into an ICT curriculum that's driven out enjoyment and the understanding of what a variable is, and prioritised the teaching of PowerPoint and other less-than-thrilling, software-focused activities. That's exactly what Pi is here to change. The Pi project was partly inspired its 1980s predecessor-of-sorts, the BBC Micro, which Upton can't help but keep dropping into conversation like some fond memory of better times. For Eben and his team (of which gaming icon David Braben is also a part), Pi is about giving today's generation a BBC Micro of their own. In fact, one of Pi's founders, Jack Lang, was himself involved with the creation of the Micro those many years ago. Now, little over a year since its launch, the fruits of team Pi's efforts are plain to see. All over the world people have been finding hundreds of inspired ways to use their tiny computers. "The one I was impressed by very early on was the ballooning one," says Upton, referring to David Akerman, who turned his Raspberry Pi into a near-space craft by sending it up to an altitude of 25 miles with a webcam strapped on.